Abstract: Results of interviews with 13 fathers who are raising children under 8 years of age with little or no contribution from the mother. While confident in their parenting, a large proportion of them felt isolated, showed little involvement with their communities, and would prefer not to be solo dads. Those with children under 3 showed the highest support needs. Dads at the Toddlers’ Day Out Harald Breiding-Buss, Brendon Smith: A survey of support for dads attending the Waitakere Toddler’s Day Out in April 2010. (pdf only). Abstract: At present teen ‘parent’ services, such as ‘teen parent units’ and others, are virtually exclusively targeted at young women. Research suggests that this is neither in the best interest of the child nor does it justice to the responsibilities of the young father, and New Zealanders as a whole have expressed the view that parenting is a shared responsibility between mothers and fathers. Harald Breiding-Buss, Tyler Guise, Tony Scanlan, Terry Voice: September 2003. Abstract: Results of 24 interviews with men who have had their first baby at ages between 15-21. Teenage fathers, while keen to be involved with their offspring, rated the support they received from agencies and/or professionals very low. The study also identified high emotional support needs for this group of fathers. Marg Bigsby, Harald Breiding-Buss, Evelyn Tritschler: presented to the PHA Conference, Dunedin, 26 June 2002. Abstract: A cooperation between Canterbury Plunket and local fathers group Father&Child Trust is presented as a model for other service providers for achieving better involvement of men in their services and adjusting to present family realities . Harald Breiding-Buss: presentation to Children’s Issues Conference, Dunedin, June 2001. Abstract:The lack of male role models in children’s lives, especially in early childhood settings, is an increasingly recognised problem in New Zealand society. At the same time, however, men’s daytime availability has improved due to changes in the structure of work, and the social climate also demands significant involvement by fathers in the lives of their children. Two main types of barriers prevent men from getting more involved with children of their communities other than their own. Firstly, the institutions that play an instrumental role in giving parents opportunities to interact with children are not very well set up to accommodate men. Secondly, men themselves often lack the confidence and often competence required to make themselves more available. The Father & Child model bridges the confidence gap between men’s time availability and their involvement in institutions dealing with young children, such as kindergartens, the Plunket Society etc. It is using its own mechanisms to improve men’s confidence and competence, for example through playgroups, and then makes those men available to provide a male face to the services of interested institutions. Harald Breiding-Buss: address to Social Policy Forum, Wellington, October 2000. 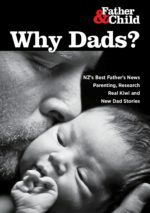 Abstract: While there is much public and political attention on the parenting role of fathers in contemporary New Zealand, both women and men complain about obstacles to stepping outside the traditional role division. The government’s policies target women’s role in the workplace through initiatives such as the Equal Employment Opportunities Trust and much of the work of the Ministry of Women’s Affairs is in this area. But no similar emphasis is put on men’s role as parents, which would be essential if a more equal team approach in childrearing is to be fostered. Surveys have found that while on the one hand there is great consensus in Society about shared parenting between mothers and fathers as an ideal family set-up, men perceive substantial barriers to their role at home. These barriers arise from attitudes by parenting institutions as well as public imagery and stereotypes. As a result men see their role as support persons for mothers take precendence over direct involvement with the children, which prevents them from asserting themselves in their role as parents. If a balanced role division between income earning and childrearing for both parents is to be achieved, social policy needs to target the father-child relationship in a positive way, and needs to encourage communication and cooperation between parents, regardless of their marital status.